We used Renew to install our PV system after a recommendation by a friend. They did all the legwork with getting our system registered and the whole installation was efficiently and neatly completed in just a couple of days. We found Renew Green Energy through the recommended suppliers on the Home Green Energy website and have never regretted choosing them to install our biomass boiler. Pre installation discussions were very explanatory and advised us well about the way ahead. Good solutions were found for housing the boiler and fuel store. The installation was really smooth and the installers were very skilled and hard working. All teething problems were dealt with well and quickly. We are delighted with our new central heating system which works really efficiently to provide us with a very warm and comfortable home. It has been very good dealing with Renew Green Energy and we are confident that they will support us well if any difficulties arise in the future. I cannot recommend them enough. Renew energy fitted both a ground mounted pv array and a solar thermal system on my roof completing works in 2016. Both systems are working beautifully and I am absolutely thrilled both with the efficiency of the systems themselves and with the service I received. All works were carried out on site with respect for my land and despite extremely bad weather everything was left tidy and returned as close to its original state as possible. All members of the team were polite and tremendously helpful attending to additional, unplanned, requests with good humor, patience and a genuine willingness to help. Renew provided a good, professional service with overall value for money and I would not hesitate to recommend them. Our experience was that Renew were a very friendly, professional firm. The planning and installation went very well and all teething problems were quickly sorted. Compared to other firms, you were efficient and easy to contact. I would have no problem recommending you to anyone planning a biomass installation. "I wanted to deal with a local company who had a proven track record and Renew ticked these boxes. Before any agreement was reached I was able to have several indepth discussions, site visits and I received a proposal report with regards to the biomass system. At no point did I feel any pressure to go ahead with the work. The Renew proposal report was very detailed, showing a number of aspects including potential returns. It was an integral part when dealing with the bank. All works associated with the biomass installation was carried out on time and to a very high standard. The after sales care that Renew supply has been second to none. There is always someone at the end of the phone who is willing and able to deal with any questions or queries". Renew Green Energy have installed two major energy projects at Sandystones. In 2012 a 50 kw ground mounted photovoltaic array was installed. I was very impressed with the professionalism and speed of the work from the request for a quotation to the handover of the completed project. The work was completed on time and the final cost came in below the original quoted price, the output from the system has been consistently in excess of the predicted production which results in a quicker payback than originally estimated. On the two instances that inverters have failed, these have been replaced under warranty and within a very short timescale. 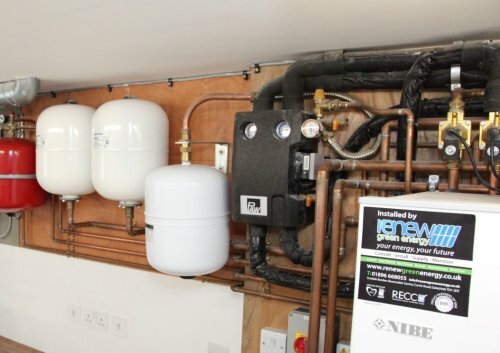 With the very positive experience I had with Renew on the solar, I decided to approach them to quote for a district heating system which involved supplying heat to the farmhouse, 3 cottages and a grain drier. Again the install was completed on time and within budget, although technically more demanding from an installation aspect than pv, I was very impressed with the quality of the workmanship and the efficiency of all those involved. I was given very sound advice to install two 95kw boilers rather than one 199kw. This decision has not only saved on running costs but has made for a very efficient system. Inevitably there are teething problems and the benefit of using a local firm has paid dividends with technicians on site within hours of reporting an issue. As with the solar, the biomass has earned more than predicted initially which has reduced the payback and increased the return on capital.I would have absolutely no hesitation in recommending Renew Green Energy. They are local, efficient and have the resources to manage. 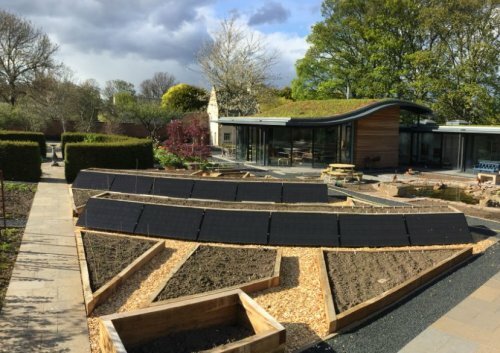 We contracted Renew Green Energy to supply & install a biomass system and a 7kw solar array.From our initial contact with the company, through the planning stage and from installation to aftercare, the company has been faultless in every respect and we cannot recommend them highly enough. Installing our biomass boiler involved building a whole new barn. The reason I would recommend Renew Green Energy is that they coordinated all aspects of the project including the construction work but also the plumbing, the landscaping and electrical work as well as the actual installation and commissioning of the boilers. Having a single point of contact for the whole project made a huge difference. When I started my build project, one of the main goals was energy efficiency, which is why I decided to build to passive standards. In order to heat the hot water and the internal of the building, should it need it, I wanted a modern energy efficient solution. As I looked further in to this, it was apparent that there was a lot of companies out there offering this. However, it became apparent that not all of them fully grasped the brief. Thankfully, after having discussions with Renew Green Energy I realised they were the ones for the job. They had a clear understanding of the technology and also offered advise on tariffs and green deal loans. They did a fantastic job of installing a ground source heat pump, solar thermal and solar PV solution. I was immensely impressed with the neatness of the installation and professionalism displayed throughout. I can't recommend them enough, well done! I approached Renew Green Energy after noticing on their website that they take an innovative approach to the location of PV arrays and I wanted to do something different to the usual roof arrangement. My idea was to align the PV arrays with raised vegetable planters in our garden. Renew Green Energy came up with a practical proposal at a good price and they delivered according to the schedule and budget we agreed. The result was just what we wanted. We found Renew Green Energy through the recommended suppliers on the Home Green Energy website and have never regretted choosing them to install our biomass boiler. Pre installation discussions were very explanatory and advised us well about the way ahead. Good solutions were found for housing the boiler and fuel store.The installation was really smooth and the installers were very skilled and hard working. All teething problems were dealt with well and quicklyWe are delighted with our new central heating system which works really efficiently to provide us with a very warm and comfortable home.It has been very good dealing with Renew Green Energy and we are confident that they will support us well if any difficulties arise in the future.I cannot recommend them enough. Delighted with the various parts of the process which include: the follow up to my initial contact, the survey of our property and explanation of the details therein, the estimate and willingness to listen , the installation team were extremely professional, very efficient and seemed really nice folk who you would be happy to have in your house. Having paid an initial deposit of 25% of cost before work commenced still no sign of final bill! Great!! 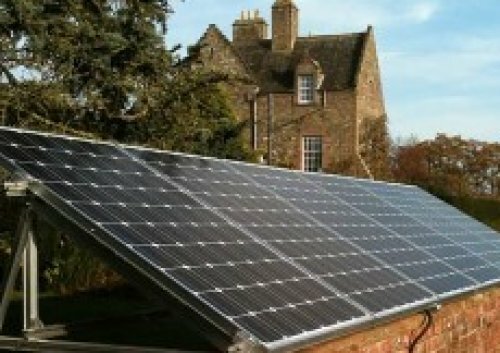 We had been looking at solar panel installations and suppliers for a number of years. In 2015, we decided to go with Renew in Galashiels as they are a local firm. Their quote for the work was comparable to other national firms. The actual installation went very well and was completed in one day. We had one small hiccup with the unit cutting out but their engineer came and sorted it out as soon as we called them, and they also helped us with the FIT registration. 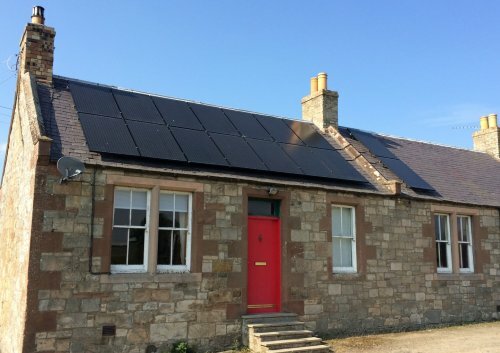 On carrying out a renovation of our cottage we looked to the renewables market to make the property as green as possible, settling on a PV and Solar Thermal system. We contacted a number of companies, some of whom did not reply, others provided rough quotes but Renew went that bit further. Visiting us at home Alasdair was professional and knowledgeable without the pressure to buy that some companies lead with, which was refreshing and allowed us time to review their proposition.On agreeing terms the work was scheduled and the team arrived over two weeks fitting the PV and Solar Thermal, integrating it with our existing heating system. 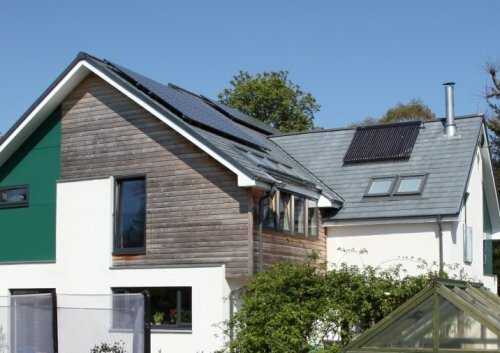 We were really pleased with the quality of work and service delivered and would recommend Renew to anyone thinking of installing a renewable system. I chose Renew to carry out our installation after discussing the job with their representative. It was clear that he understood my requirements and that we could "work together". Also, as they are a local firm, I could always camp on their doorstep if anything went wrong !I am very happy with the quality of the installation and the service I received. Nice people to do business with.